The ideal kitchen is spacious enough to offer plenty of work surfaces for food preparation, and plentiful storage areas for cookware and ingredients. It's also sleek, convenient, and easy to keep clean of everyday kitchen messes and clutter. The ideal kitchen should also be a stylish and attractive room that enhances the value of your home. Most of all, it should fit comfortably into the home you already have. Designing an elegant and minimalist kitchen that can comfortably prepare elaborate holiday meals and still look tidy afterwards may seem like an impossible task -- or at least an expensive one! 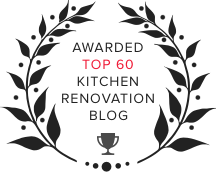 But with some clever design features and modern fixtures, your kitchen can transition from minimalist elegance to culinary inspiration and back again. A cluttered counter is one of the biggest contributors to a messy-looking and stressful kitchen environment. However, having small cooking appliances readily available is a necessary convenience for most of us; dragging out the coffee maker, blender, or stand mixer from a cabinet every time they're needed is too high a price to pay for clear counters. 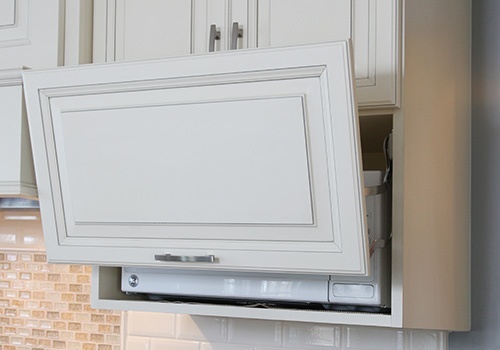 A much more convenient and elegant solution is to keep appliances tucked away behind false panels that blend seamlessly into your cabinetry and keep your kitchen looking tidy and uncluttered. Small appliances aren't the only kitchen features that can benefit from this elegant camouflage. 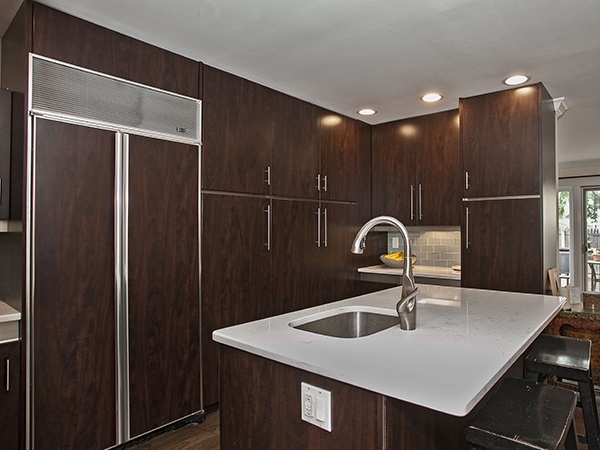 Rather than standing out in jarring contrast to the rest of your kitchen decor, your refrigerator can become part of your cabinet design scheme with custom false panels. 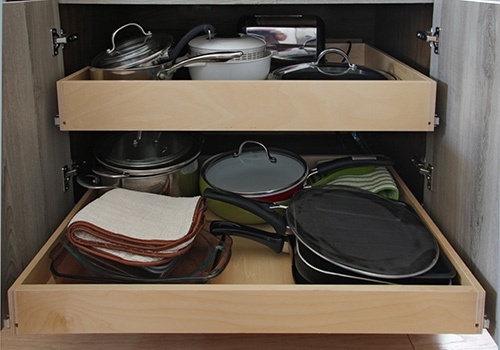 Even the drawers in your cabinets and kitchen can enjoy this minimalist upgrade, disappearing into a single clean surface but allowing you to access all your cookware and tools with just a touch. Cultivating a minimalist kitchen design doesn't mean doing away with half of your cooking tools or eliminating your spice rack. By tucking your kitchen storage shelves behind a smooth cabinet panel, you can maintain plenty of convenient and organized space for your pots and pans, dishware, measuring tools, seasonings and ingredients, and everything else that customarily resides in your kitchen without cluttering up your kitchen space. 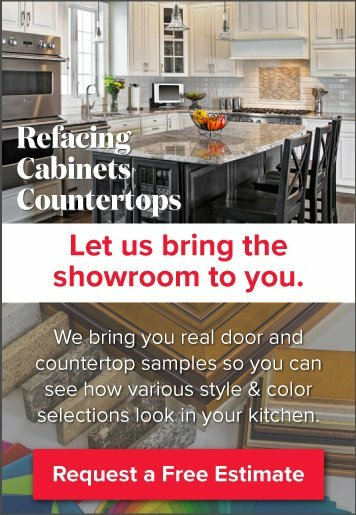 You can even add extra work surfaces in the form of pullout table tops disguised as drawers, for those holiday dinner preparations or school bake sale nights. Perhaps more than any other room in the home, the kitchen generates a lot of waste, and it's most convenient to have a trash bin readily at hand. But having the kitchen trash on display is not the most attractive decor choice, and it takes up valuable floor space in smaller kitchens. A pull-out cabinet for your waste and recycling bins keeps them handy while tucking them out of view, letting your beautiful kitchen shine. 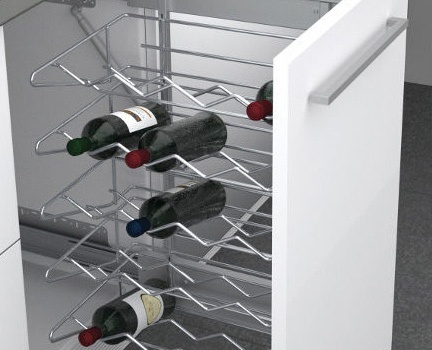 A similar option exists for convenient and safe wine storage, providing you with your own wine cellar right under your kitchen counter. A clean and simple hi-gloss glass backsplash cleans up with just a wipe. The glass subway is synonyms with modern fashion. We love glass, sleek in it's own right, another minimal-look element. A touch of glass is a touch of class, instantly elevating your kitchen to your mature, sophisticated motif. 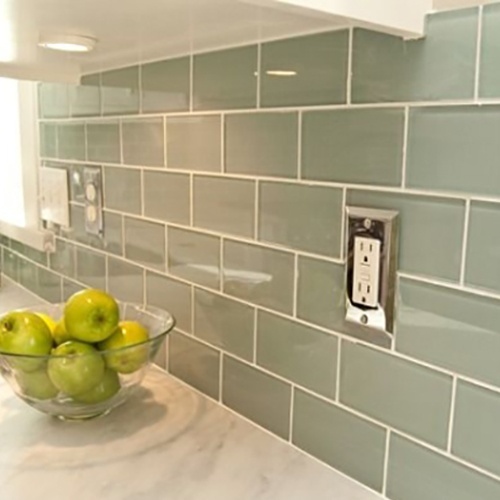 Glass tile is ideal for quick clean up, minimizing mess in the kitchen. Convenience, functionality, and minimalist beauty truly can coexist in a kitchen of any size, with our design expertise.